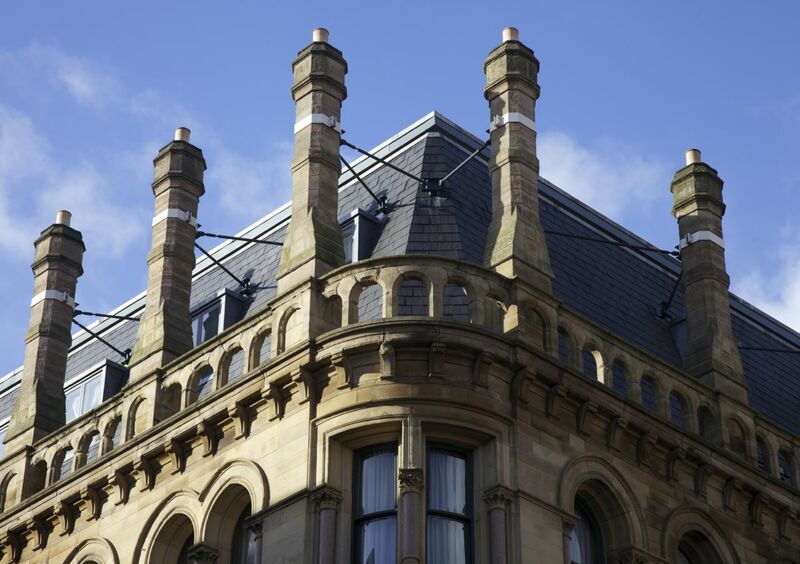 Manchester is a city known for its cotton mills, but it is its textile warehouses that remain the distinctive element in its street-scape and make it unlike any other city in England. From the mid-19th century onwards, the marketing of textiles came to dominate Manchester’s economy. For this reason it is the commercial warehouses, built by the manufacturers, wholesalers, independent merchants, traders and packing companies during the century after 1840, that are the most potent visual symbols of the city’s Victorian character. Warehouse buildings of the 1820s and 1830s had little architectural pretension and they tended to follow Manchester’s mills in adopting a strictly utilitarian approach. As trade further accelerated and the city’s merchants became wealthier, the architectural style of warehouses changed, the merchants aspiring to premises of more impressive appearance to reflect, to potential customers, their growing stature. From the 1840s, they achieved this by adopting the Italian palazzo style, inspired by the 14th and 15th-century architecture of Florence, Genoa and Venice. The palazzo style was justified primarily on associational grounds: Renaissance street architecture in Italian cities were seen as developing in line with their expansion as centres of trade, just as Manchester was in the mid-19th century. A typical surviving early example is Edward Walter’s warehouse fronting Portland and Charlotte Streets, built from 1855-56 (1). The windows here are indicative of the function of each floor of the warehouse – the large windows on the first floor light the main showroom, while the top-level windows are both smaller and more numerous as this is where the lightest and most delicate goods would have been stored and inspected. Each storey is boldly defined by a stone string-course, as are the lines of the window arches, and the parapets on the four corners of the roofline serve to emphasis the vertical dimension as well. The clear visual emphasis on ‘massiveness’ here is in keeping with the projection of an image of strength and solidity, but it also reflects wider principles in Victorian architecture at this time, which were dominated by the influence of John Ruskin and his writings on architecture. 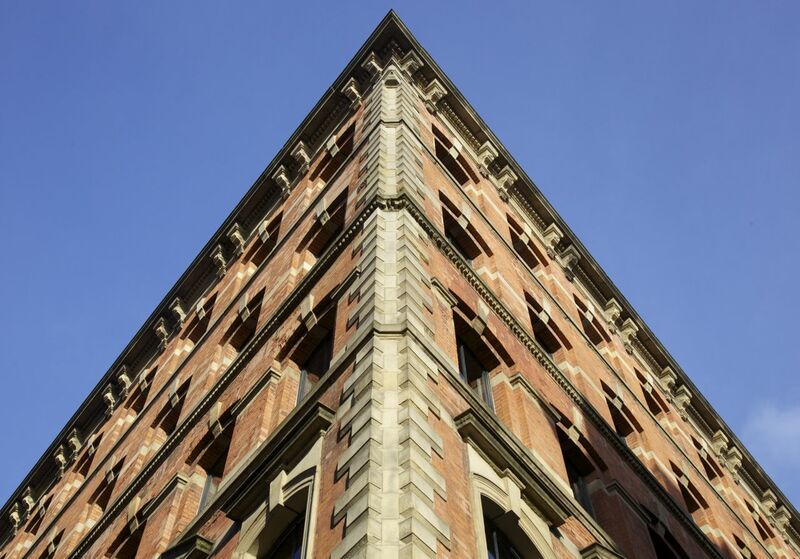 In the 1850s, some warehouse designers, such as Travis and Mangnall, who designed the Watt’s Warehouse in Portland Street (2), began to move away from the Palazzo Style. 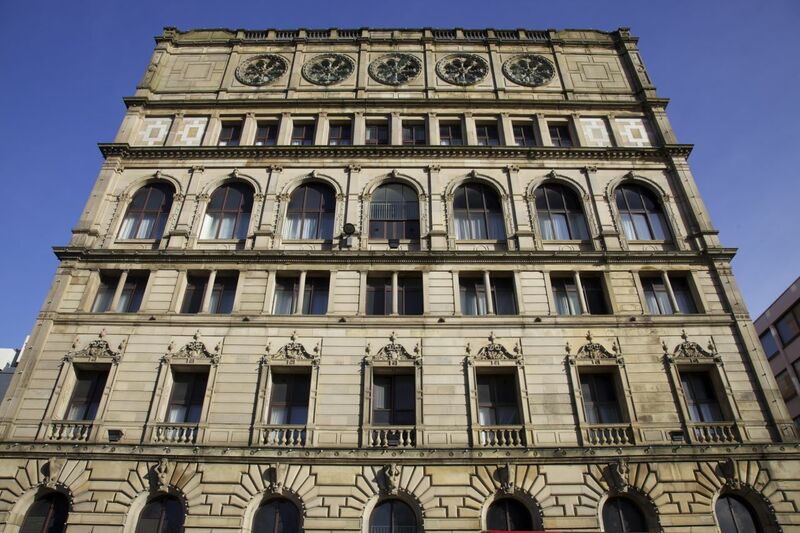 Now the Britannia Hotel, the Watt’s Warehouse was a vast building built for S. & J. Watts, the largest wholesale drapery business in Manchester. His enormous warehouse – 300-ft long and nearly 100-ft high – is more eclectic in its architectural style. The general outline resembles the Fondaco dei Turchi in Venice, but each of the six floors is given a different treatment, ranging from Italian Rennaissance to Elizabethan and culminating with wheel roundels in the roof towers. Inside, the warehouse had four large internal wells and a system of circulation which segregated customers, staff and porters. 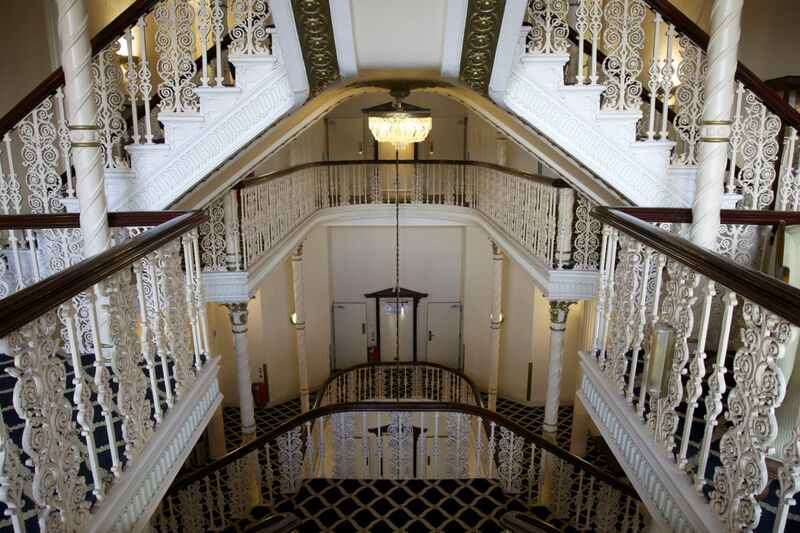 The original sumptuous cast-iron staircase is preserved (3), with its cantilevered bridges spanning the six floors, all made out of richly ornamented cast iron. 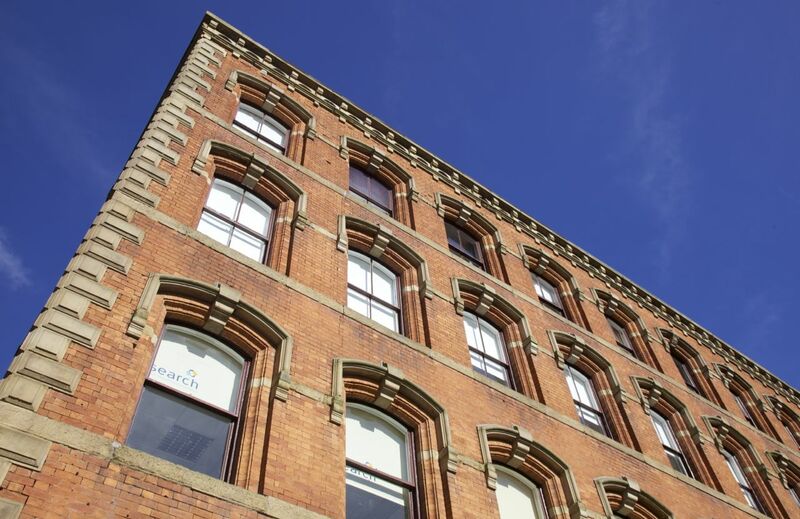 From the 1860s until the turn of the century, Manchester’s warehouses proliferated in a wide variety of architectural styles, the best preserved now clustered along Princess Street. A high proportion of these warehouses were by the architects Clegg and Knowles, with Charles Clegg the leading designer, and all are roughly the same height of four or five stories with almost no gap between the frontage and the street. 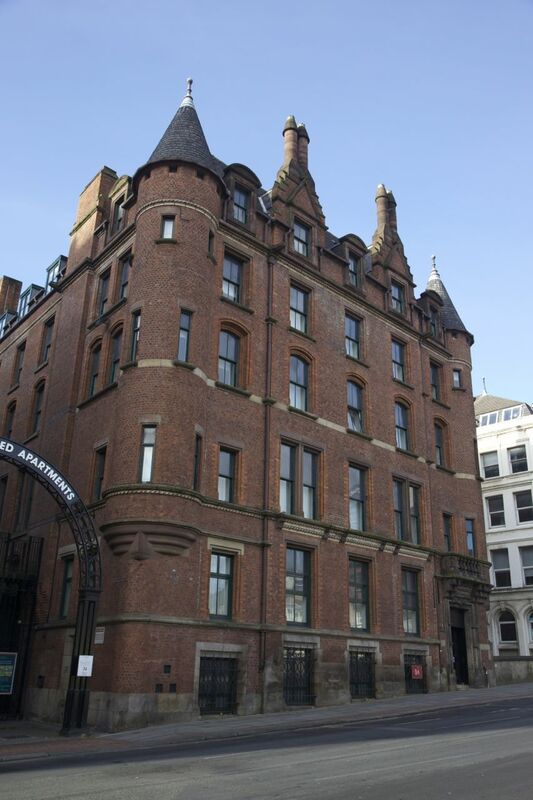 Of the many surviving examples, we have Dugdale’s warehouse from the late-1870s, in a loose Gothic style with an open arcaded parapets and tall chimneys (4); Charles Clegg’s 1869 warehouse at 101 Princess Street in an immaculate Renaissance style with brick with sandstone dressings (5); and 74 Princess St, built in 1880 in the Scottish baronial style by the architects Corson and Aitken (6). Many of these Victorian warehouses have now been converted into flats, hotels or restaurants, their former use now difficult to detect from the outside. Yet, such is their number and sheer bulk that some inevitably remain in a kind of architectural limbo, either part-occupied or awaiting redevelopment. In an early warehouse by Edward Walters on Charlotte Street (1855), a group of tenants have only very recently redeveloped its interior. 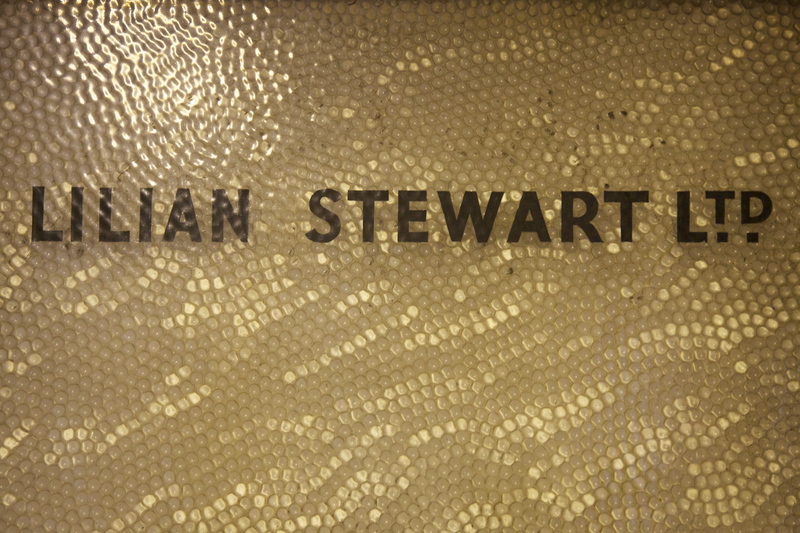 On my first visit in early 2012, amidst piles of rotting wood and the original cast-iron columns, were traces of the building’s last tenant – the textile retailer, Lilian Stewart Ltd, who, like many others in Manchester, gave up the business in the 1970s (7). With the company’s name still seen on one of the doors (8), the space suddenly became imbued by the still-living past, filled with unexpected possibilities and stories waiting to be told. However, on returning six months later, that space was already transformed into a whitewashed shell in preparation for its new life as a luxury apartment. 7. 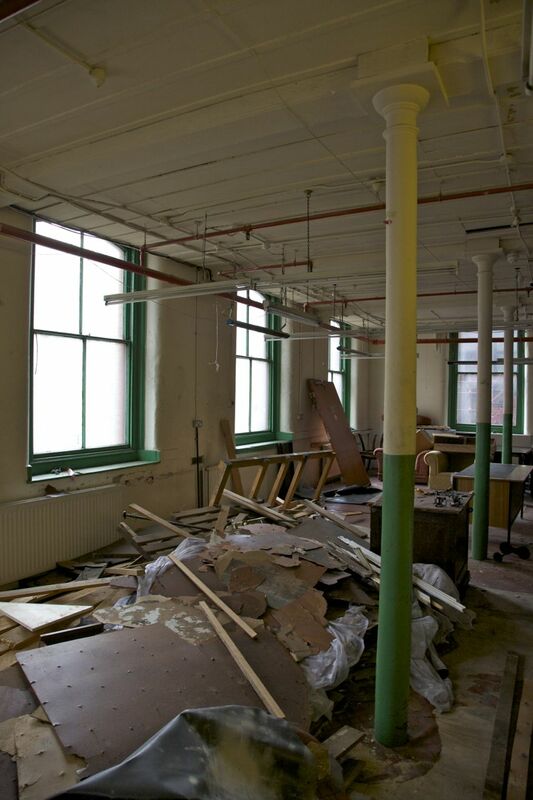 Interior of Edward Walter’s warehouse (c.1855) at 34 Charlotte Street, Manchester, in early 2012. 8. Interior of Edward Walter’s warehouse (c.1855) at 34 Charlotte St in early 2012. 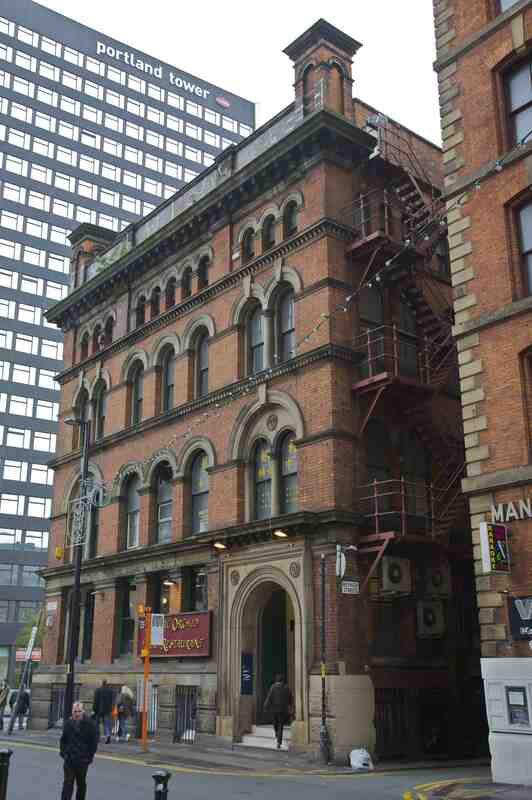 Looks like a few great offices here, especially the one right on portland street manchester! Do you have a website where i can check for evenmore information?